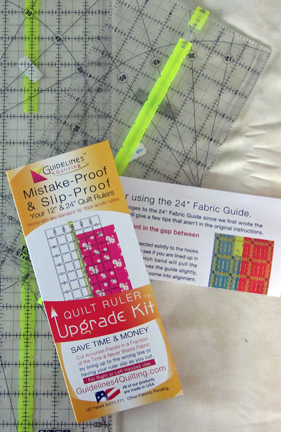 In January I reviewed Grip Strips™ by Guidelines 4 Quilting. These prevent rulers from slipping as I cut. That review is here. 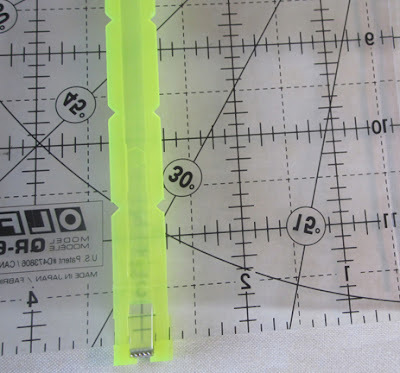 The company has developed a new combination product, the Quilt Ruler Upgrade Kit. It promises to 'Mistake-Proof and Slip-Proof your 12" and 24" quilt rulers'. These tools allow you to cut accurate pieces and you never waste fabric by lining up your ruler on the wrong line. How many times have you done that? The package contains enough Grip Strips for both a 12" and 24" ruler. 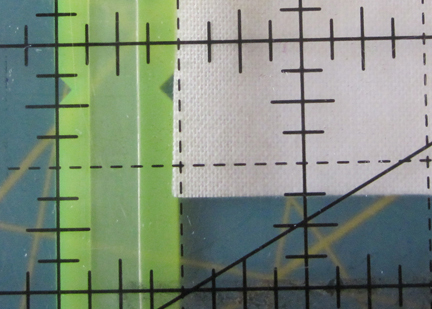 The Fabric Guides are yellow plastic strips that are installed on the underside of your ruler. They are held in place by hooks that go over the short edges of the ruler and there is a stretch band that keeps the guide in place. You slide the guide up to the line for the strip width you want to cut. Grip Strip installed underneath my ruler. Make your first straightening cut on the edge of your fabric and then slide the ruler over the fabric until the Fabric Guide's edge catches the fabric's edge and cut your strip. 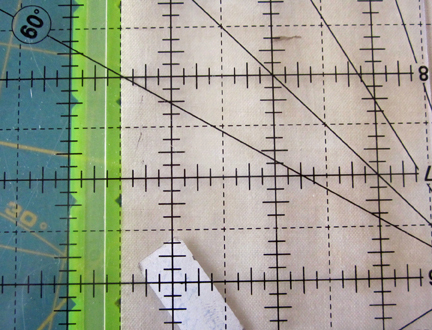 I found the guide worked very well on my 12" ruler but when I used the guide on my 24" ruler I had to watch that it lined up correctly against the cut edge along the entire length of the ruler. I wouldn't install the guide if I was just cutting one strip but for multiple strips, the same width, it is definitely a time saver and prevents mistakes.